I wonder if it is the American education system that fails us, sometimes, or if it's our own lack of curiosity for the things we aren't being told. In grade school, I never learned about the Asian-American civil rights leaders who helped shape this country; but in high school, I was introduced to one. "Everything changed for me on the day Pearl Harbor was bombed. On that very day--December 7, the FBI came and they took my father." She goes on to write about the hysteria of war and the cries to "get the 'Japs' out," about the evacuation of thousands and thousands and about sleeping in a horse stable on army cots and muslin bags filled with straw. "And for chairs, everybody scrounged around for carton boxes, because they could serve as chairs. You could put two together and it could be a little table. So it was just makeshift." And, most importantly, she writes about feeling betrayed by her country--not a betrayal filled with rage and resentment, but with confusion and pain. "I was so red, white and blue," she writes, "I couldn't believe this was happening to us. America would never do a thing like this to us." Reading Kochiyama's essay, just a few pages long in a large anthology, made me realize how much of my own family's history needed to be explored. We too were a people disempowered and disenfranchised when the Communists took over China. My grandparents were forced out of the place they called home, my parents were brought to a promised land around the world, and sometimes I wonder if America will ever feel like home to them. "Historically, Americans have always been putting people behind walls. First there were the American Indians who were put on reservations, Africans in slavery, their lives on the plantations, Chicanos doing migratory work, and the kinds of camps they lived in, and even too, the Chinese when they worked on the railroad camps where they were almost isolated, dispossessed people--disempowered. And I feel those are the things we should fight against so they won't happen again. It wasn't so long ago--in 1979--that the feeling against the Iranians was so strong because of the takeover of the U.S. embassy in Iran, where they wanted to deport Iranian students. And that is when a group called Concerned Japanese Americans organized, and that was the first issue we took up, and then we connected it with what the Japanese had gone through. This whole period of what the Japanese went through is important. If we can see the connections of how often this happens in history, we can stem the tide of these things happening again by speaking out against them." Kochiyama was a fearless activist. She fought for quality education in areas that were not often paid attention to, and she was among those arrested during a protest to demand jobs for Black and Puerto Rican workers. She supported political prisoners through letter writing, and helped win reparations and a formal government apology for Japanese-American internees. 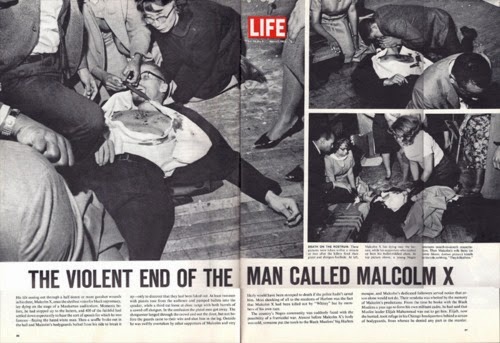 There's Kochiyama, lifting the head Malcolm X as he took his last breaths. A 2013 profile on NPR notes: "Most of the audience in the ballroom fell to the ground after the gunfire, crawling away for safety. But Kochiyama headed toward the injured Malcolm X, who was lying on the floor." "I mean, Malcolm had fallen straight back, and he was on his back, lying on the floor. And so I just went there and picked up his head and just put it on my lap. People ask, “What did he say?” He didn’t say anything. He was just having a difficult time breathing...I said, “Please, Malcolm, please, Malcolm, stay alive.” But he was hit so many times." The day I began to see powerful Asian American women stand up against injustice was the day I was born into consciousness. To hear voices like Kochiyama's, to see individuals reclaim their individuality and identity from the labels given to us between "docile" and "model minority." 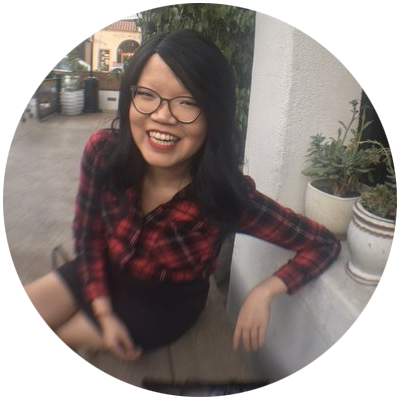 Jenn over at Reappropriate said it best: "Today seems a little darker without Yuri’s light in the world. But I think Yuri would be the first to want us to mourn her passing by rededicating ourselves to the fight; by finding our missions; by learning from each other; and by vowing to never let our battle cries fall silent." 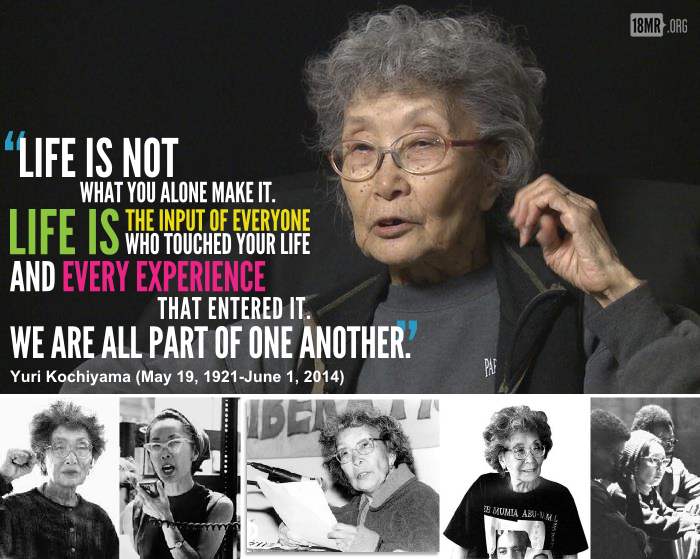 Rest in power, Yuri Kochiyama.